Remote controls are generally something that's cheaper to replace than repair, but if you're particularly fond of a specific remote, you might not be keen on giving it up just because a button or two don't work quite right. It appears that over time, the contacts wear down and need a little assistance to keep functioning. A hole punch, some super glue, aluminum foil, and whatever tools are required to take the remote apart is all that's need to make the remote buttons functional again. 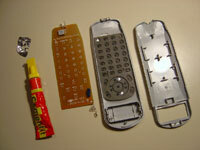 Simply use the hole punch to create a small round of foil, glue the foil to the contact from the remote key and voila. I'm personally sticking with eBay, where remotes are available by the hundreds, or the local electronics store here, but it's certainly a cool project and might keep the kids busy fixing broken remotes for a few hours in the summer.